Dan Biggar's expected decision to stay in Wales will be a significant relief for head coach Warren Gatland, according to former captain Gwyn Jones. 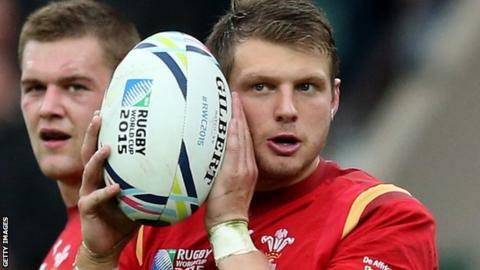 Fly-half Biggar has reportedly verbally agreed to sign a new dual contract with the Welsh Rugby Union and Ospreys. The 26-year-old is out of contract at the end of the season and Jones believes the top French clubs would have been desperate to sign him. "He is key to Wales by now. He had an unbelievable World Cup," said Jones. "The rumour was he hadn't signed before the World Cup, gambling to see how he performed perhaps. "And his price might have gone up because you'd imagine that every team in France would want him considering the standard of his kicking, but thankfully he's staying [in Wales]." Biggar impressed during the World Cup, amassing 56 points in four games and was praised for being among the tournament's most astute tacticians. He signed a dual contract in March, becoming one of 12 leading Welsh players whose salary is funded 60% by the WRU and 40% by the regions. Crucially for Gatland, the contracts also give the Wales management far greater control over how often the players appear in regional matches. Roger Lewis, whose tenure as WRU group chief executive ended on Saturday, said last week the governing body now has the financial power to persuade some of the nation's biggest stars to reject lucrative offers from abroad, and Biggar could be the first to prove the case. "As far as I know he's staying and hopefully it's sorted," said Ospreys forwards coach Chris Gibbes on Sunday. "He's a key person in this team and a proud Osprey." Biggar played his first game of the season for Ospreys on Sunday, but could not prevent them from slumping to a fifth Pro12 defeat in six games. As well as stemming the flow of players out of Wales by signing the likes of Biggar, the WRU could also be set to announce the return of those who have been tempted away in recent years. Full-back Leigh Halfpenny (Toulon) and centre Jonathan Davies (Clermont Auvergne) are expected to end their time in France by joining Welsh regions on dual contract. Further attempts will also be made to secure Taulupe Faletau on a dual contract after Gatland refused to allow Newport Gwent Dragons to sell the number eight to Bath.